Civic activists representing several communities in Moldova condemn the hateful and socially divisive messages promoted as part of the presidential campaign. In a press conference held at IPN, they stated that professional skills alone, and not their personal life, must be decisive in choosing among candidates. Polina Ceastuhina, the representative of the Group of Feminist Initiatives from Moldova, mentioned that stereotypes of the past century concerning the role of women in society are being maximally exploited, and that such messages perpetuate the idea that the value of a woman is not equal to her competences, but to being fertile and having a man who loves her. “A woman’s place is everywhere and she is free to run and vote. We got the right to vote a hundred years ago and we have the responsibility to fulfill it, while staying aware of all the discourses at play during this campaign”, highlighted Polina Ceastuhina. The representative of the Resource Center for Human Rights, Olga Bîtcă, said that during the current election campaign women are attacked below the belt, and that the advisers of the presidential candidates, who formulated the message that women are not getting votes, made an enormous mistake and showed lack of professionalism. The parties that started this trend now use inciting to hatred. Tezera Abebe, the representative of communities from African and Asian countries in Moldova, brought up an appeal to responsible institutions to seize and show resistance to hateful messages against refugees, promoted in the campaign. It stressed that a public person allowing themselves to use hate speech and involve the media in disseminating this message, must be regarded as an aggravating factor. The representative of the Information Centre Genderdoc-M, Angelica Frolov, said that the one who wants to reach the country’s leadership must come up with solutions for every citizen to enjoy a better life. If they instead come up with hatred and disunity in the campaign, these will continue after the elections. She also stressed that her political views should not be interpreted as the voice of the entire LGBT community in Moldova, of which she is part. This clarification was made in a context where, after posting on a social network a message that reflected her personal political preferences, Angelica Frolov says she became the heroine of a distasteful pamphlet, thus being blamed by friends of having damaged the image of a certain politician only by endorsing them. Mihail Plăcintă, the representative of the Ukrainian community in Moldova, said that youth is very worried about what is happening in the country, and that the presidential candidates must be careful in statements they make during the campaign so as to avoid harming relations with other states. The fact that the Ukrainian Ambassador to Chisinau was called to Kiev last week is a first sign that things cannot continue like this, and that the candidate of the left should think twice about his statements. 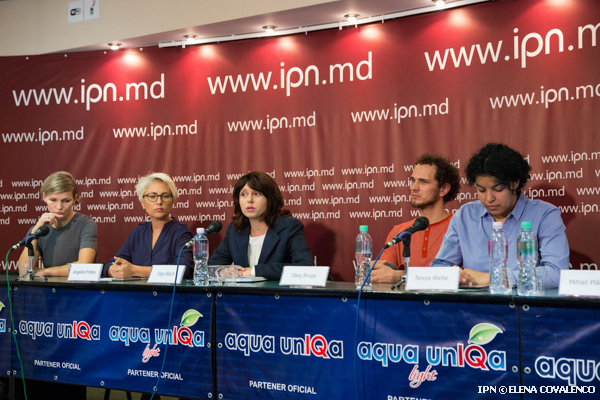 At the same press conference, activist Oleg Brega noted that anti-European hysteria may disqualify Moldova as a civilized state. If the country refuses to accept international treaties on fundamental human rights, it will not qualify for membership of the Customs Union, since even that requires respect for human rights, rights of migrants and the LGBT community, concluded the activist.